Unilever understands the power of markets in the developing world. In fact, 55 percent of its $66 billion in sales last year came from there. So when the nonprofit Water and Sanitation for the Urban Poor (WSUP) got together in 2010 with board member Unilever to explore new enterprise opportunities in sanitation, the consumer goods giant supported the idea wholeheartedly. Together, the team decided to focus on an in-home sanitation project in Kumasi, Ghana. Unilever and WSUP already had a significant presence there. Plus, the habit of paying for sanitation was long established in that region. Joined by design firm IDEO, the team traveled to Kumasi in November 2010 to gain a better understanding of the sanitation market and further develop the business model. Based on these findings, IDEO developed the “high touch service toilet” concept, which eventually became the social enterprise Clean Team. The team placed several prototype toilets in Kumasi households, and ultimately settled on a rental, stand-alone toilet and emptying service. In 2011, IDEO designed a brand strategy to scale the Clean Team toilet service, including uniforms, radio ads and posters. The following year, Clean Team received funding from the Stone Family Foundation and The Bill and Melinda Gates Foundation to build 1,000 toilets. A business was born. In April 2012, Clean Team Ghana was incorporated as a company, and six months later the first Clean Team toilet came off the production line. One thousand toilets have been shipped, and there is a waitlist of more than 200 customers. At the end of February 2013, Clean Team had more than 20 staff and approximately 2,000 people benefiting from an in-home sanitation facility. By 2014, it hopes to serve 10,000 customers and 70,000 people. The toilets cost between $50-60 USD to build. Currently, Clean Team will deliver a portable toilet to a house for free, but charges a weekly fee to collect the waste. Households can opt for two to four waste collections a week (two collections for $10 USD/month, 3 for $15 USD/month and 4 for $20 USD/month). The waste is transported to a processing facility, and then taken to the municipal treatment site. In the future, the company plans to convert the waste into energy and organic fertilizer to sell to commercial farms in the region. Clean Team is working with the Gates Foundation and others to find suitable treatment processes. (See model below for more details on the process). Below is a recent Q&A with Andy Narracott, deputy chief executive of WSUP. Heather Esper: How important was it to choose a place to pilot Clean Team where the poor already were willing to pay for sanitation? When you scale, will you focus on entering communities that also are willing to pay for sanitation? Andy Narracott: Establishing any new business is a challenging path full of pitfalls and roadblocks at every turn. One of the biggest challenges for us is to provide a reliable, polished service from day one at an affordable price. To enable us to get off on the best footing, we chose to start in a middle- to low-income area where most residents had no toilet in their home. As we expand, we are moving into lower income areas whilst working to drive down the costs of our business and launching lower-cost services. We believe that the poor will be willing to pay for products and services that are designed for them, which is why we worked with IDEO.org to design a business that appeals to their needs. The response we’ve had so far tells us there’ll continue to be a huge demand for our services as we scale. HE: Since you aim to make in-home sanitation the norm for consumers, what are some of the messages you are leveraging to do so? AN: Our customers are hardworking, family-oriented people. Naturally, they want control over their toilet experience and the best for their family, rather than resorting to long walks, long queues and bad smells that are the norm of public facilities. So our message is that we give people a way to provide the best for their family. We are building a brand that is centered on reliability, professionalism and consistency that respects the family and elevates sanitation as an essential part of a healthy community. HE: What other activities are you doing to create a new market for in-home sanitation? AN: Our main focus has been on getting the toilet into mass production. Most portable toilet products on the market were designed for the leisure industry and wouldn’t be able to withstand the daily use by our customers. We sought to produce a robust, low-cost but high quality product – and we’re very pleased with what we’ve got. Durable, yet attractive. We’re now set up to mass produce the toilets to support our expansion. Other areas of focus on the supply side have been the toilet chemical and container cleaning equipment, both of which do not exist for our market. We’re making steady progress in both areas. Another big area of development is developing the ability to treat the waste for safe disposal. Eventually, we hope to produce market-ready products derived from the waste, such as decentralized electricity generation and distribution. We’re currently working on two fronts: re-designing standard anaerobic digestion technology to be modular, portable and low-cost. And through WSUP, we’ll be trialing new processing technologies that turn the waste into something of value. HE: Can you talk more about the importance of branding for Clean Team? AN: Through our research with IDEO.org, we found that brand is important in Africa. It helps establish trust in a place where good service is uncommon. But that isn’t enough – we have to deliver on our brand promise, which is where our focus is right now. Our partnership with Unilever has helped us understand the importance of brand in scaling a business. Working on our brand early has helped us focus our efforts on providing a consistent and reliable service before we scale. It helps our new employees quickly grasp what Clean Team is about. It will help us quickly make real impact as we expand into new geographies. HE: It seems like the waste collection and processing system you’ve established would allow you to incorporate paid, public toilets into your product line fairly easily. Is this something you’ve considered? Why or why not? AN: Public toilets in Ghana are widespread – but sadly so many of them substandard and are more of a public health hazard than a convenience. Branching out into the management of public toilets is an obvious way for us to increase our impact. But for now, we’re focusing on doing one thing really well: providing a scalable in-home sanitation solution in Ghana. HE: As you mention on your website, even in areas where public toilets are available, ensuring these facilities meet acceptable standards is challenging and installing sewers is a long term solution. Does Clean Team have a role in moving governments toward centralized sewer systems? Or would the development of centralized sewer systems be bad news for your business? 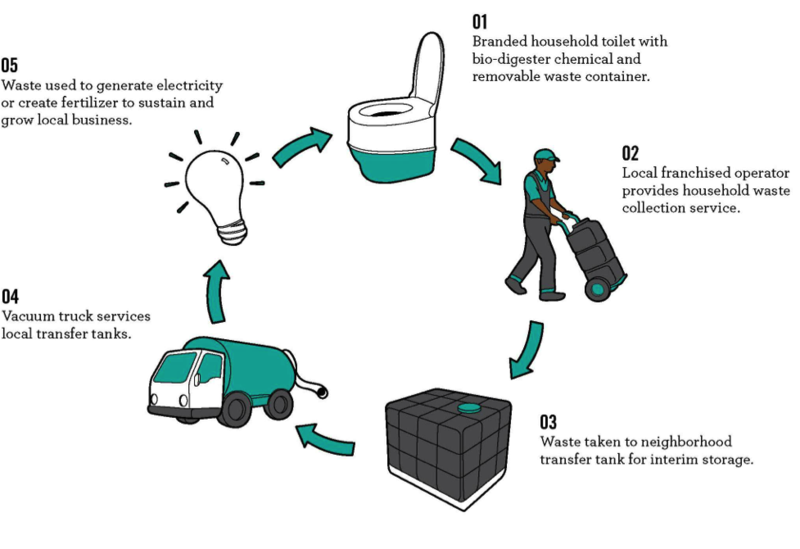 AN: We’re intent on growing Clean Team into an affordable and scalable sanitation businesses. To do this, we need to keep laser sharp focus on our core business whilst proving our financial viability. According to UN sanitation data, around 2.6 billion people worldwide are served by inadequate sanitation methods and a further 800 million practice open defecation. With increasing population growth and rural migration, sewerage is unlikely to be a feasible solution at this scale. It is essential that more cost-effective and modular systems like ours are given the support to serve this enormous need. To find out more, follow Clean Team on Twitter and through the company’s Facebook page.